The SSC emphasizes community, collaboration, and empowerment to foster a culture of responsibility and to ensure a sustainable future. 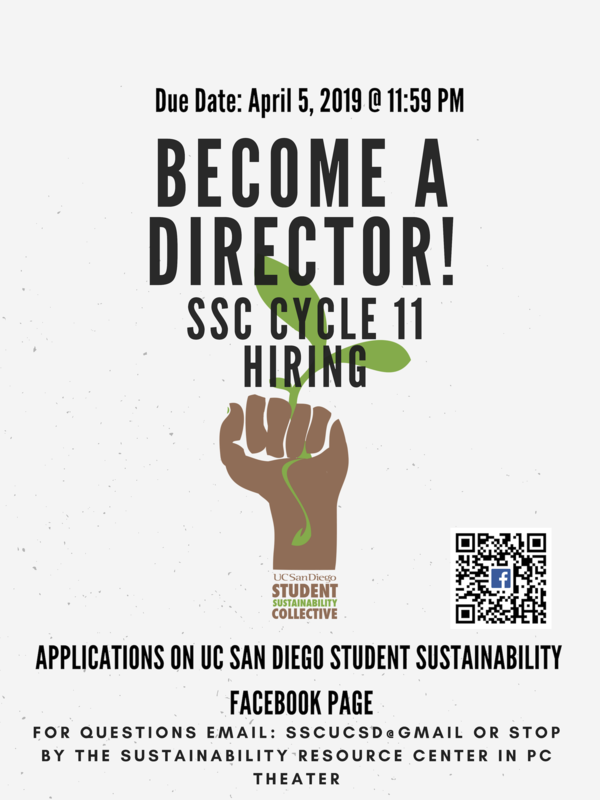 The Student Sustainability Collective (SSC) is a passionate group of student leaders dedicated to promoting sustainable policies, education for students, and social justice dialogue on our campus. The Sustainability Resource Center, located next to Price Center Theater, is an open space for the UCSD community with resources about sustainability (books, director office hours, campaign involvement, and funding opportunities) to foster a culture of responsibility, collaboration and empowerment for campus sustainability. We are open Mondays through Fridays from 9 a.m. to 4:30 p.m. The space is shared by the SSC and the Sustainability Office. Reservations for events at the SRC space can be made through this link.